High uric acid levels in the blood tend to form sodium urate crystals in the joints if they start accumulating, leading to a condition known as gout. 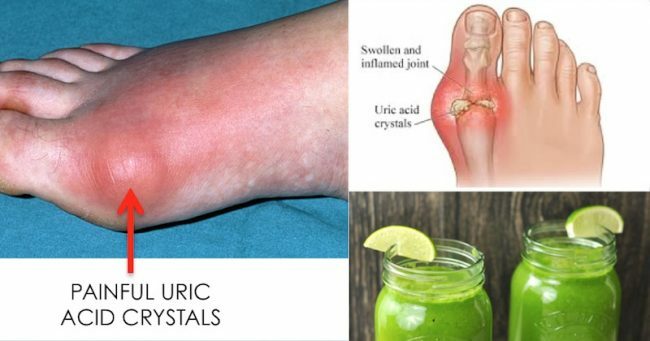 In most cases, the uric acid crystals appear in the joints in the knees, ankles, elbows, and wrists, and especially in the joins of the feet, at the base of the big toe. Gout is common in middle-aged men and women after menopause and is believed to run in the family. The most important factor in its development is a person’s diet. Gout attacks usually occur without warning and are manifested by excruciating pain in the joints, inflammation, swellings, and sensitivity of the area to touch. Severe attacks also lead to rapid heartbeats, chills, and fever. If left untreated, the symptoms can last for a few days. Afterward, the symptoms disappear until the next attack. Yet, if the condition is ignored, it can restrict joint motion, due to the formation of hard crystal lumps begin in or near joints, under the skin around joints, and even in the kidneys and other organs. Gout is seriously aggravated in the case of high blood pressure or diabetes, due to the poor function of the kidneys. The main causes of gout include high uric acid levels produced by the liver or the excessive intake of purine-rich foods. Our body converts purine into uric acid, increasing their levels, and thus contributes to the accumulation of deposits in the joints. Moreover, the regular consumption of alcohol can also cause gout, since it increases the uric acid production by interfering with the function of the kidneys. People who suffer from gout should avoid acid-forming foods, like sugar, flour, processed/refined foods, dairy, fried foods, soft drinks, tobacco, and alcohol. Moreover, foods rich in purine include red meat, mushrooms, anchovies, asparagus, herring, sardines, meat gravies and broths, mussels, and all organ meats. Moreover, bean sprouts, bean curds, and soya milk are also rich in purines. These people should consume plenty of fruits and veggies but avoid tomatoes, asparagus, spinach, strawberry, cauliflower, rhubarb, and peas. Potassium-rich foods – Foods high in potassium like avocado, raw cultured dairy, coconut water, salmon, squash, bananas, and apricots can help balance intracellular fluid relieving gout. Moreover, gout sufferers should exercise regularly, for at least half an hour daily, three times a week. The consumption of fresh green vegetable juices will help you detoxify the body, regulate the pH levels, fight inflammation, and heal the gut. Cabbage and celery will help the breaking down of uric acid and its elimination, and thus will relieve gout and arthritis pain. Cucumbers, papaya, and pineapples fight inflammation and helping the treatment of gout. Beets and bitter gourds cleanse the liver and the kidneys of toxins, boost their functions, and prevent the formation of uric acid crystals.